The StrandHotel Seeblick lies on the eastern shore of the Kiel Estuary in the Baltic Sea spa of Heikendorf, right on one of the most beautiful sandy beaches of the Bay of Kiel. The hotel has 12 single and double rooms, two of them suites, fitted out with every comfort. It was clear to the owner early on that renewable energies and maximum comfort should be central to the planning of the heating. The objective was to combat rising energy costs and be prepared for the future. Right from the start, for instance, the house was designed for the use of a brine heat pump with a cooling function. The under-floor heating thus provides energy-saving cosiness and a pleasant room atmosphere in both winter and summer. 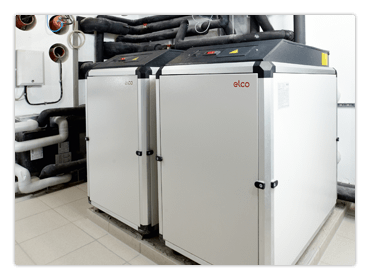 Further energy sources are a modern, modulating gas condenser boiler and an integrated solar plant – both from ELCO. *Compared with standard EnEV calculation. This entry was posted in Allgemein on 15. October 2013 by admin.